A Winged Genius, 883-859 B.C. The Assyrian kings, who ruled in Mesopotamia from the ninth through the seventh century B.C., projected an image of themselves as all-powerful, divinely sanctioned monarchs. They adorned their palaces with monumental friezes that displayed their authority and wealth. 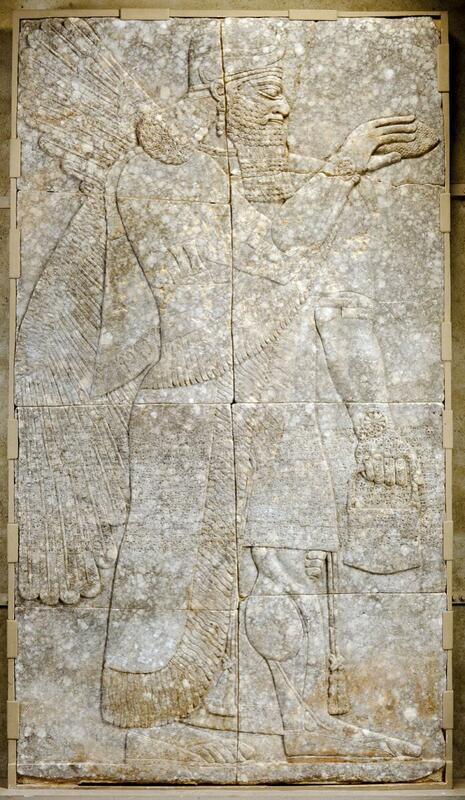 This low relief, once painted in bright colors, belonged to a series of slabs adorning the fabulous palace of the great ruler Assurnasirpal II at ancient Kalhu (biblical Calah, or modern Nimrud), the Assyrian capital in central Iraq. Standing in profile, according to artistic convention, the figure in the frieze is a winged "genius," or protective being. He wears the horned cap, knee-length tunic, and long, fringed cape associated with divinities. Whether fertilizing the Tree of Life or anointing the king (depicted on another slab), the genius clutches in his raised right hand a conical date-palm spathe, the male part of the flower. In his left hand he holds a small pail that would have contained a magical liquid or pollen. Running through the chiseled relief like an incantation is a cuneiform inscription detailing the king's ancestry and such achievements as his prowess in warfare and hunting and his march to the Mediterranean in search of cedar timbers for his palace.